File: Taylor Map – Fifth Avenue Hotel.jpg.” Wikimedia Commons, the free media repository. 28 Nov 2016, 14:07 UTC. 6 Dec 2018, 16:17 <https://commons.wikimedia.org/w/index.php?title=File:Taylor_Map_-_Fifth_Avenue_Hotel.jpg&oldid=222927477>. The first climactic moment in Wharton’s novella happens at the beginning, “She was bad … always, They used to meet at the Fifth Avenue Hotel”. Unusual for an author to start literature with a climax point, however, Adeline Tinter states “the necessity of “a vivid opening” formulated in The Writing of Fiction (78.) Tinter goes on to quote, WF The Writing of Fiction, “If his first stroke be vivid and telling the reader’s attention will be instantly won… The arrest of attention by a vivid opening should be something more than a trick… [for] the narrator can “situate” his tale in an opening passage which shall be a clue to all the detail eliminated (78.) Wharton is successful with her actions by using such a sentence to grab the reader’s attention. Shortly after Wharton introduces the twelve-year-old narrator by which according to his memory, “No one, in my memory, had ever known anyone who went there; it was frequented by “politicians” and “Westerners,” two classes of citizens whom my mother’s intonation always seemed to deprive of their vote by ranking them with illiterates and criminals” (Wharton 240). It was funny that the narrator would see the hotel as such when the hotel was known to house the most elite that New York had to offer. Wikipedia states, “The hotel was host to numerous notable guests, both foreign and domestic, and was, for a time, the most exclusive hotel in the city, and the center of social life for elite New Yorkers”. How could the people of the town see the hotel as such, only the lower class of people went there, that was their opinion, not of the people of New York City. New Yorkers saw the Fifth Avenue Hotel as the place to be and the happening thing to do on New Year’s day. It seemed like if you were of prestige importance, you were to stay there as Presidents did during this time. For the Wesson’s to see this as a low-class place they were mistaken, because of Lizzie, the Wesson’s and all the people they knew, they felt like the people who went to the Fifth Avenue Hotel were beneath them. The luxury hotel was located at 200 Fifth Avenue, Manhattan, New York from 1859 to 1908. Landscaping the full Fifth Avenue between 23rd Street and 24th Street, at the southwest corner of Madison Square. At first, the location was the Madison Cottage, a frame structure with an eighteenth-century core, it served as a stagecoach stop for passengers headed North. Shortly after Madison Cottage it was replaced by Franconi’s Hippudrome, a tent-like structure, made up of canvas and wood. It accommodated up to 10,000 spectators that watched chariot races and other Amusements of the Ancient Greeks and Romans. After the Franconi Hippudrome was torn down it was to make way for the Fifth Avenue hotel. The Fifth Avenue Hotel cost two million to build and took three years to do it, it was designed by Griffith Thomas and William Washburn and the builder name was Amos Richards Eno. The area was known as NoMad which means North of Madison Square Park. The funding of this project was refused by New York bankers so Eno turned to Boston. Wikipedia states, “The hotel, which quickly developed a reputation as New York’s most elegant, became “the social, cultural political hub of elite New York,” and brought in a quarter of a million dollars a year in profits”. Fifth Avenue Hotel superseded the expectations of others as the hotel ran advertisements featuring a fireplace in every room, employed four hundred servants to serve its guests and offered private bathrooms-a luxury they were not accustomed too. Housing countless notable guests, both foreign and domestic such as Ulysses S. Grant, Chester A. Arthur, Edward, Prince of Wales, Duke of Argyll, Dom Pedro of Brazil, Prince Agustin de Iturbide y Green and many more. It also housed fat cats like Boss Tweed, Jay Gould, and Commodore Vanderbilt. 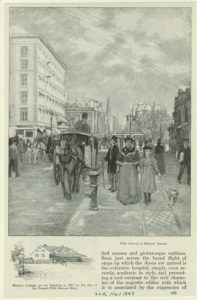 With memorable moments such as Gore Vidal made the Fifth Avenue Hotel a setting in his novel 1876, Dr. John Franklin Gray lived at the hotel, the editor of The New York Times John C. Reid revied Zachariah Chandler the chairman of the Republican National Committee to work out the campaign for the Presidential election of 1876, and on May 21, 1881, the United States Tennis Association was founded inside. It was the home of the Republican party which they named a corner nook in one of the public rooms as the, “amen corner”. Thomas Collier Platt held his Sunday school there and no projects would go forward until they had his amen, thus the amen corner. The closing of the Fifth Avenue Hotel occurred at midnight on April 4, 1908, and was demolished. During the last day of opening, it was reported that customers of the hotel’s bar spent $7,000 in drinks. It was later occupied by an office building named the Fifth Avenue Building, then changed to Toy Center. Robert Maynicke and Julius Franke designed the building for Eno’s grandson, Henry Lane Eno and until 2007 it housed the International Toy Center. The name was taken up by a Fifth Avenue Hotel located at 24 Fifth Avenue, however, later converted to apartments and a sign on the Toy Center commemorates the hotel currently. Although the Wesson’s felt as if the hotel was of the lower class that could be because of several different reasons such as, social customs, generations, traditions and the patrons who went there was of new money, much like Henry Priest. Wharton had first-hand knowledge of the hotel as she lived in the area as well as having a real-life Henry in her life that she cared deeply about. The use of the hotel in the affair between Lizzie and Henry speaks volumes of new money as all that attended the hotel were what we call it today high class (ex. Politicians). We would not distinguish old vs. new, just that of class, the care factor if a person is from old money or new money would not be a factor as it was in the novella. The novella maybe fiction but for all fiction, there is a little truth in every story. Tintner, Adeline R. “The Narrative Structure of ‘Old New York’: Text and Pictures in Edith Wharton’s Quartet of Linked Short Stories.” The Journal of Narrative Technique, vol. 17, no. 1, 1987, pp. 76–82., www.jstor.org/stable/30225169.